Brussels sprouts are grown on roughly 88 farms in New York, with 58 acres harvested for fresh production and 2 acres for processing (2007 Ag Census). 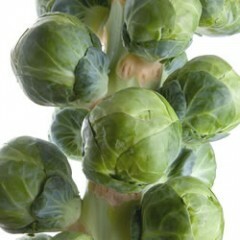 They are members of the Brassicaceae family which includes cabbage, cauliflower and broccoli. Being cool season crops, they are well suited to the New York climate. Most cruciferous crops have similar cultural requirements and are susceptible to a common set of insects and diseases. Seeds of Brussels sprouts are typically sown in a greenhouse or seed bed about 5-6 weeks prior to transplanting into the field beginning around mid-June. Fields are ready for harvest between 90 to 180 days after planting, depending on the variety and weather conditions. In New York, harvest occurs from September through November. Buds or sprouts grow along the sides of long, thick stalks and mature from the base of the plant upwards. They are harvested when they are 1 to 2 inches in diameter. Individual buds may be hand harvested into baskets, with several harvests per season. Alternatively, entire stalks can be harvested and sold for processing or at the retail market. To further assist farmers looking to sell into the wholesale markets, the Cornell Vegetable Program has put together some helpful tools. The tools provided here consist of a color photo guide highlighting the grades of some of the most common vegetables grown for wholesale market in WNY. To aid in the visualization of the grading sizes, the templates are available here for you to print off. These are scaled to size and can be used to create sizing templates to be used by workers on the wash and pack lines.